The emotional and medical state of many of the adopted Roodewal Kennel rescue dogs coupled with the information such as stories, vet cards, affidavits, photos’ etc. submitted to the Schnauzer Voice assisted Schnauzer Friends to be able to work for justice for the Roodewal Kennel schnauzers. We also had a few advocate and lawyer schnauzerholics offer their services pro-bono. So this legal muscle combined with all the information and evidence we have collated assisted us in becoming a powerful force for justice. We have been engaging with various stakeholders to work out the best way to proceed to get justice for the people and schnauzers that were hurt by Roodewal Kennels which was owned and run by Elmarie Celliers. 1 - Legal: One was to lay criminal charges against Elmarie Celliers. This would take many years to resolve and involve lengthy court cases and money. Schnauzer Friends South Africa does not have the financial means to support such a path. Most of us would be called in to provide evidence etc. If she was found guilty, any monies would revert to the state. In addition, the South African animal protection laws, are not the toughest. 2 – Public Exposure: The second option was to approach various media channels like Carte Blanche, You Magazine, newspapers etc. and basically get the whole ugly story out there. This would be great for exposing Elmarie Celliers but would not help the animals going forward. 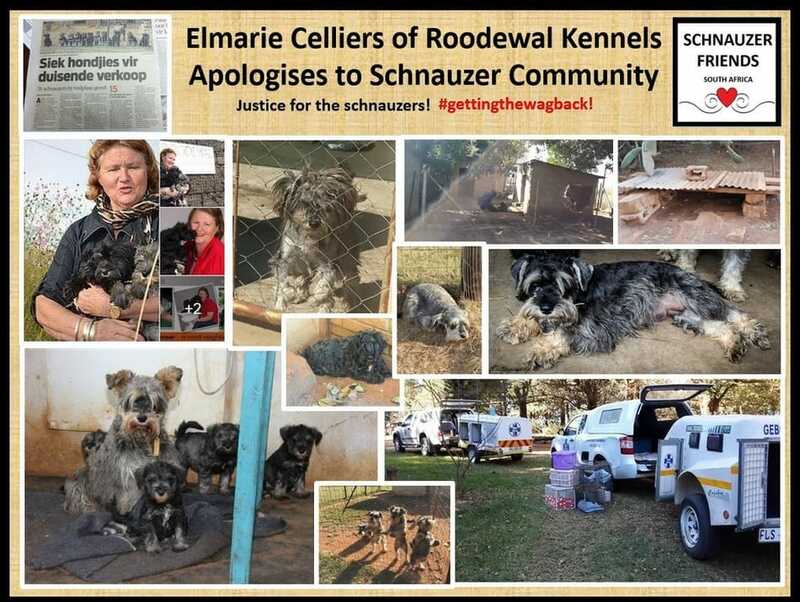 We felt that we have already exposed Elmarie Celliers and Roodewal Kennels extensively on our various Schnauzer Friends Channels as well as it being in various newspapers, web sites already. We have chosen the reconciliatory option as this has a better outcome for the schnauzers and will assist animals and rescue teams going forward. The aim of Schnauzer friends rescue is to assist in the rescue of Schnauzers, to sterilize and rehome the dogs and to ensure their ongoing well-being, as well as to expose and shut down the puppy mills. Elmarie Celliers has agreed to this reconciliatory option and we have recently received a letter, signed by her, containing the acknowledgement, apology, thank you and the pledge to donate some funds to rescue. (Posted at the top of this web page). We have recently recieved a donation to assist Schnauzer Friends Rescue with rescue costs going forward. In addition, Elmarie Celliers has paid a lump sum towards the medical costs incurred by Schnauzer Friends South Africa. Elmarie Celliers has also confirmed that she has ceased all dog breeding operations at Roodewal Kennels and that she will not conduct, run, manage, partake or be involved, directly or indirectly, in dog breeding in any way whatsoever going forward. I would like to thank Elmarie Celliers and her representatives for working with Schnauzer Friends to obtain this positive outcome and for the financial contributions made. We now have closure. 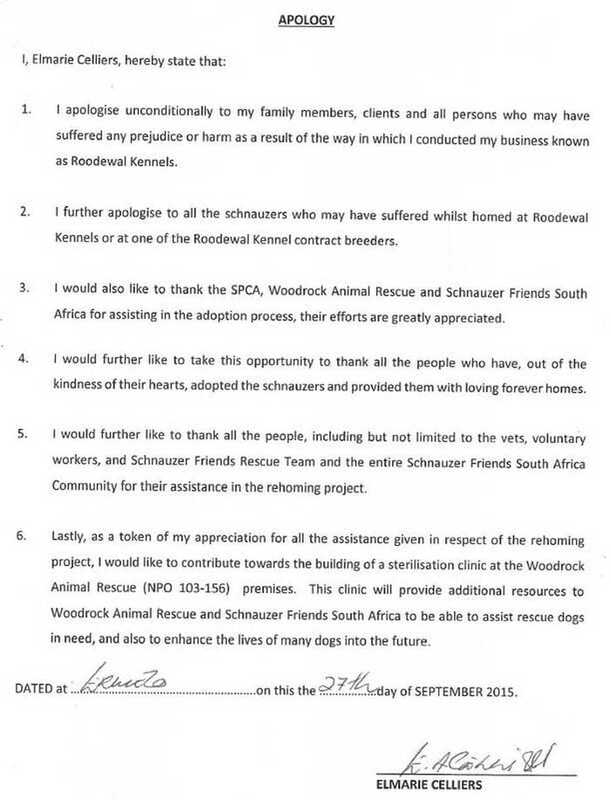 The entire Schnauzer Friends community played an important role in the Roodewal Kennel rescue and rehoming project. So a HUGE THANK YOU to all of you. By standing together we made a difference! A huge high five from schnauzers worldwide for donating, sharing, caring and opening your hearts and homes to these rescue doggies. They now get an opportunity to live the remainder of their lives as pampered pooches and no longer breeding schnauzers locked outside in the cold and rain. Schnauzer Friends South Africa will continue to be a voice for the voiceless. We will continue to educate our community and to expose puppy farms and unethical breeders. A huge thank you to Sheryll Steyn for being the driving force behind the Schnauzer Voice and collating all the information. Also a big thanks to advocate Carol-Ann Myburgh for all her pro-bono time and dedication to these rescue schnauzers. Thank you to the other legal people who gave their time and expertise and also to the dedicated Schnauzer Friends Rescue Team. 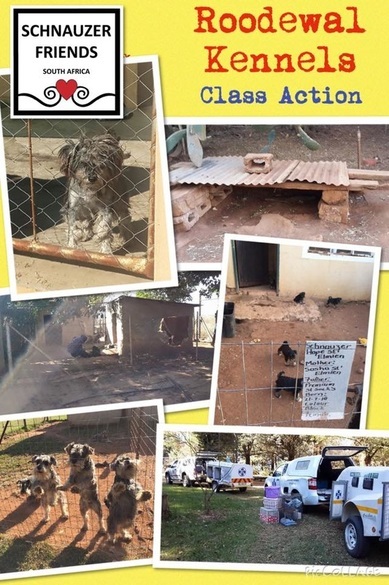 The passion and drive in the Schnauzer Friends South Africa community to achieve justice and a positive outcome for the Roodewal Kennel schnauzers has been amazing. The Schnauzer Friends South Africa rescue team smiles when we achieve our catch phrase “#gettingthewagback” and the whole Schnauzer Friends South Africa community have helped us to get the wag back in to these rescue schnauzers tails! To see comments from Facebook from the community click on the comments on the Facebook post below.